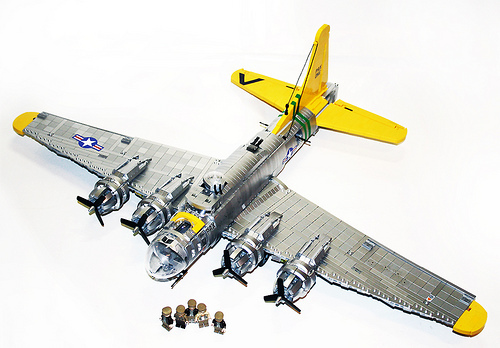 The B-17 Flying Fortress by Alex Schranz (Orion Pax) is as beautiful as it is expensive having used rare metallic LEGO elements for the entire hull of the aircraft. I now have a newfound respect for what a combination of wealth and building skills can bring. Please excuse me as I go back to drooling over the model. I was so annoyed to see a non lego model before I took a closer look… Holy #$%(*&#$!!!!!!! There are parts on this model that I didn’t know existed. I have a -lot- of silver legos but I can’t even touch this. It’s just a staggerring effort of scrounging. Beyond that it is a staggerringly good looking model. Truly a great looking model. All that metallic silver just makes it so impressive. The scale…the details…ughhh…love it!! !